Hewitt, Medved, Levin, Kristol, Kasich and some other GOP elites have become spoilers of the 2016 presidential election. It is unappealing to watch this unfold. On Fox this morning, Kasich sits back and goes unchallenged while he discusses the things America cares about; the problem is, he is adopting Donald Trump’s talking points. That’s right: Kasich has sat back, seen why Donald Trump has gotten more votes then any Republican in primary history, and, with that ridiculous Joker-like grin on his face, has the gall to totally give back most of what Trump has been saying since June 16th, when he first announced for the presidency. This is the same Kasich who said just the opposite in some instances, and yet the host sat there and didn’t bring it up! Friends, the fix is in: they want to throw the election to the Democrats. The archaic GOP, like a boneyard of prehistoric mammals, does not realize that it can never EVER win another election in its current incarnation. The gerrymandering of the voting populace by negligent immigration policies, lack of assimilation, bolstering of special interests, an indoctrinating educational system and the ineffectual. uninspired GOP have all contributed to this. 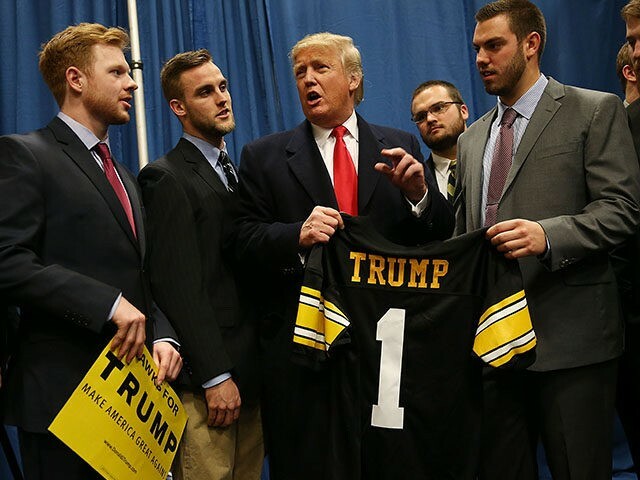 In Donald Trump, they now have a quarterback who can throw a long ball, has a run game, can fill a stadium, read a defense and win. But instead of getting out in front and providing him a great offensive line, the GOP have become part of the corrupt defense trying to take him out! We have a man who is the most exciting political figure in decades, and his overall game-winning message is America First. My question is, simply, “Why?” Why do the GOP not rally around him? Why do they embolden the opposing team? In a recent article, Roger Simon suggested that Trump separate “signal to noise.” namely, Trump is making the Trump U controversy an issue while it should be background noise, as Hillary contends with questions surrounding the Clinton Foundation, which has dealt and still deals with hundreds of millions of dollars from foreign powers. The Clinton Foundation is the signal; Trump U is the noise. Donald should concentrate on that, but he doesn’t. He should be talking about the horrific job numbers (and the lies about them) and the complete failure of the Obama economy, or the reports of terrorists coming across our Southern border. Instead, he’s talking about Judge Curiel. I completely disagree with Roger. Trump does speak of these things, and quite effectively! But it is the media that puts focus where it wants. Trump mentions a few things in a speech, and the MSM, the politically-infected GOP and the Democrats explode it into nonsense. I can see the Democrats and biased media doing it, but when folks who are supposed to be on the same team fail to block for the quarterback, it looks like someone got to them and they are purposely throwing the game. It is they who are the ones creating their own self-fulfilling prophecy. Look, I know for a fact that many who are not rallying around have invested time and made tons of money “advising candidates” to lose weight, wear this or that, speak in this or that way — the so-called consultants. They get paid very well. So when their “quarterback,” who has been groomed and polished and dressed and practiced and rehearsed and advised and polled, gets whooped by a non-programmed non-politician, you can see why they are reluctant to jump on board. Imagine if they did. Imagine if they rallied around Trump, instead of laying in wait to jump in and attack him for some “noise” he may once in a while allude to. You see, it is they who are the ones that make it “signal,” not Trump. The Big Ideas plaguing our nation are what motivates Donald Trump. We know this, but the media and the pundits infect the rest of the populace with an obsessive and totally unjustified false narrative to take down Donald Trump. It is they who made a big deal about the Judge thing; they all jumped on it ad-infinitum. Instead of promoting his positive and promising platform for an America that has been forgotten, neglected, gutted and subverted by the left, some of those on the right are sticking the knife right in his back. They have turned on our quarterback and now help the defense in stopping his passing game. Instead of jumping on the State Department’s decision to not release Hillary Clinton’s TPP emails until after the election; instead of discussing the globalist University speech John Kerry gave about a ” borderless world;” instead of empowering Donald J. Tump with the best offensive and defensive line a team could ever have and unify to win, we have a group who would rather throw the game. You see, I have listened to ALL of Donald Trump’s speeches. I have heard his vision for America, and not one other candidate or politician has gotten to the heart of what is bringing our nation to the brink. This is what they should obsess over, not the bulls—t they offer the American public. I have not heard or seen such a barrage of attacks on any other politician over minor nothings. WE know Donald Trump is not racist, sexist, or xenophobic. Every single person who has known him for years understands this and have said it; and yet pundits continually make this a “signal,” instead of taking it off the table once and for all. They must now coalesce and unify to provide cover for him. Hillary Clinton and the progressive party should get their full attention, to stop her from the possibility of winning the Presidency. It is up to We the People. We the People must be Donald Trump’s offense and defense. We must hold steadfast and vigilant in holding accountable any and all who wish to subvert the will of the people. We must let him throw the long ball for America.